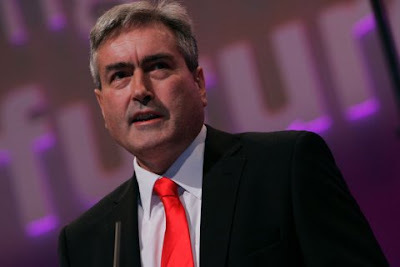 At First Minister's Questions on Thursday Labour Leader Iain Gray highlighted the failures of the SNP Education policies. In Dundee we have the Education Convener telling us that cutting £4 Million from the Education Budget will make the schools better. Along with my Labour colleagues on the City Council I am committed to delivering the best possible education service for Dundee. Friday's Courier covers this story in some detail. I attended the end of the DCA board meeting this evening. The DCA is a great resource for the city. The DCA is well worth a visit for the exhibits or the cinema. I was at the AGM of the Dundee Ice Arena board this evening. This was a very interesting meeting. The Ice Arena is well worth a visit for the whole variety of ice sports. Watch out for Dundee Stars playing the Edinburgh Capitals on Friday evening. This is also live on Sky TV. On Saturday there is also the ice show Grease on Ice on Saturday. Our quest to try to understand the cuts which were announced by the City Council's Administration on Monday continues. I have written to the Convener of Leisure, Arts and Communities asking for a briefing. My colleague Kevin Keenan has made the statement below. 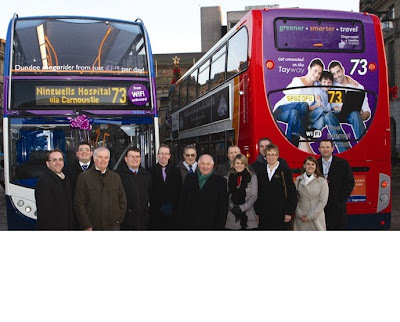 This afternoon along with a number of council colleagues I attended an event to launch new buses on Stagecoach's route number 73. This service goes from Arbroath to Ninewells Hospital, for more information abut the service click here. This is a service which I use sometimes and it offers a good service to the West End. Buses are really changing and these ones have free WiFi. 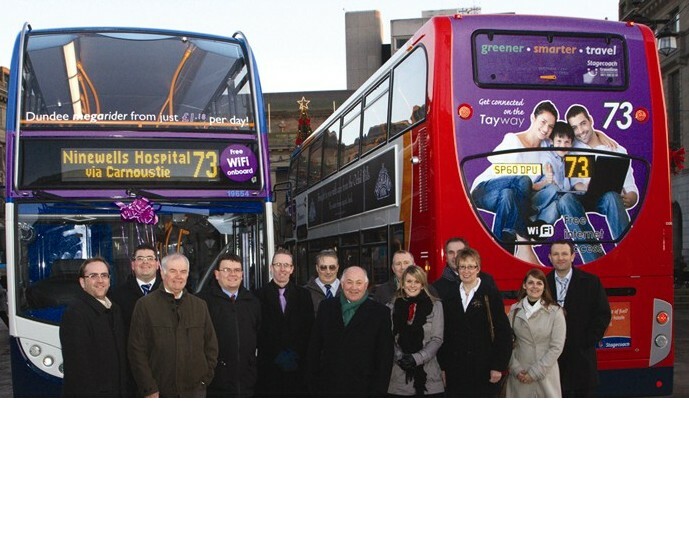 The picture shows council colleagues and staff from Stagecoach and myself at the launch event. On Tuesday evening I attended a meeting of the Harris Academy Parent Council. This was an interesting meeting which talked about progress towards refurbishing the school with the first meeting of the Project Board to look at this next month. The main item on the agenda was the upcoming inspection of the school by Her Majesty's Inspectorate of Education. Monday saw the veil of secrecy removed somewhat from the ongoing process of setting the City Council's Budget. The Administration proposes to cut £14.589Million from the Council's Budget. You can see some limited details of the proposals here. The most appalling aspect of these cuts was that the SNP Administration have tried to describe these as a success. At Monday evening's Policy and Resources Committee SNP Councillors were laughing about the cuts they are going to impose. I am committed to doing what I can to protect public services and deliver the best possible outcome for the people of Dundee and the staff of Dundee City Council. I am seeking a briefing from the Convener of Leisure, Arts and Communities about the impact of cuts in the Leisure & Communities Department. Much more detail is required and the Administration must face up to the fact that councillors from a variety of parties who represent the majority of first-preference voters in the 2007 Dundee City Council election have not been convinced to take part in closed-door meetings. To show true leadership and put the best interests of the city first the Administration should be considering a new approach that is acceptable to the other parties in the City Council. If you have any questions or comments about these proposals please do not hesitate to get in touch with me. I have raised my concerns about the possible spin-offs to the Dundee economy which might be caused by the proposed closure of RAF Leuchars. I have contacted council officers to ask about the possible impact on the Dundee economy and also about the possible impact on the future of Dundee Airport. I have also written to the Ministry of Defence asking for some clarity on the issue. 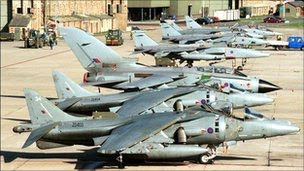 I am concerned about reports which suggest that the future of RAF Leuchars is under threat. I hope that this possible closure does not have a detrimental impact on the defence of the UK. I am seeking information about the potential impact on the Dundee economy. I presume that there are a number of Dundee businesses which receive orders from RAF Leuchars and its associated workforce. I am also concerned that there have been suggestions that RAF Leuchars could be used as a commercial airport, with the likes of Ryanair operating from it. Such a proposal might actually be good for Dundee but I think it is important that we consider all the implications. If Leuchars was operating as an airport what would the impact be on future of Dundee Airport? Dundee Airport is important for Dundee's business and academic community and makes a contribution to the economic development of the city. The City Council while not now operating Dundee Airport has invested money in the airport over many years, it is important that the impact on the investment which the council has made is considered. Tonight I attended a meeting of the Development Management Committee. I voted against proposals to build a hotel just off Riverside Avenue. I agreed with the officers who were not convinced that the proposal met the council's policy criteria. This afternoon I attended a couple of meetings in my role as a member of the board of Dundee Ice Arena. The meetings looked at the important issues of health and safety and also at the bar and catering issues. I'm seeking a briefing from officers in charge of Economic Development in the council's City Development Department about what the city council does to promote the city as a shopping destination. I am interested in this after the council took the decision on the casting vote of the Convener to increase on-street car parking charges. I have been approached by a number of business people in the West End who are concerned that increased car parking charges will have a detrimental impact on their business. I am seeking a meeting to look at the ways in which the city is promoted. I am particularly keen to find out how areas such as South Tay Street and the West Port are promoted. The UK Government's decision to increase VAT caused an increase in the cost of off-street car parking. I was not convinced that this should also mean an increase in the cost of on-street car parking which are VAT exempt and that is why I voted against the increase. Since the decision was made I have been approached by a number of businesses in the West End who are concerned that this will have a detrimental impact on their trade. Some are already feeling that times are tough as a result of the economic situation and the recent poor weather has not helped. I am keen that the council does all it can to help the economic development of the city and I want to hear what officers of the council are already doing and look at ways in which further assistance can be given. I am calling for rail improvements in the Dundee area. A new line opened today between Bathgate and Airdrie which should improve services in the central belt. Rail companies, the Scottish and UK Governments and local authorities and local businesses should look at ways in which the rail service in the Dundee area could be improved if they worked together in the interests of the city. I welcome the opening of this new line between Bathgate and Airdrie. I support improving the rail system in Scotland. I think that some consideration should be given to promoting further rail improvements around Dundee. I want to look at the frequency of services to Scotland's other cities, I want to ensure that direct services continue between Dundee and England, I want to see if we can get more regular services which stop at all the stations along the Tay Estuary. I was pleased that the City Council decided last week to make its voice heard about the need for Network Rail to support the Tay Estuary Rail Study. I think that this is a scheme that has a great deal of merit and that Network Rail and others should be looking to see how and when it could be implemented. I have been campaigning for an improved railway station in Dundee, it is just as important to deliver improved rail services to Dundee and I hope that over the next few years the council, Network Rail, the train operating companies and the Scottish and the UK Governments will work together to deliver these which would be in the best interests of our city and our country. I was pleased to join members of the Diocese of Dunkeld's Justice and Peace Group at a brief vigil for peace in Israel/Palestine. A just and lasting peace in Israel/Palestine is important. I think that at this time of year when some of the focus is on the events which took place in the Holy Land 2000 years ago it is worthwhile thinking about the current situation in this land. Peace is the central message of all the religions associated with the Holy Land, I was happy to join local people in promoting the message of peace. The SNP Transport Minister Stewart Stevenson was right to resign. His complacency during the worst of the weather last week was inexcusable. It was a shame that it took so long for him to resign, apparently the First Minister tried to persuade him to stay on. This shows how out of touch the SNP Administration has become. 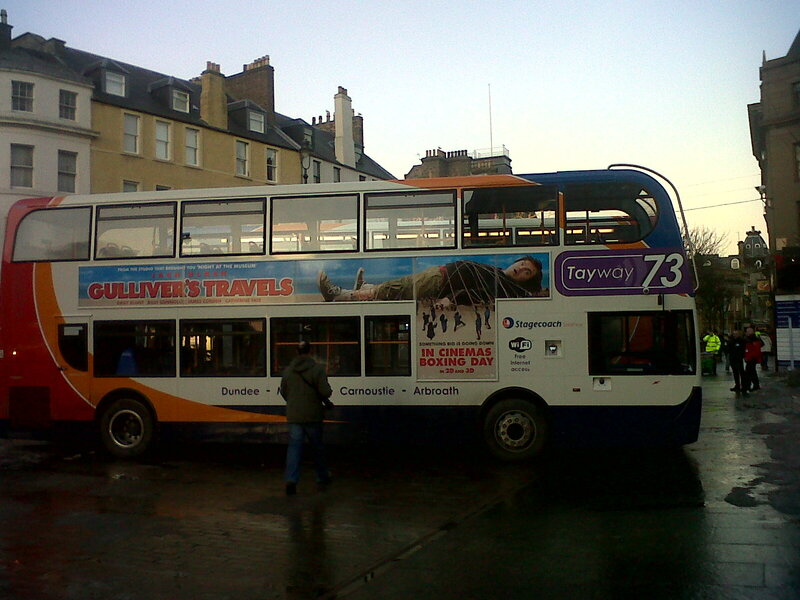 “Scotland had lost confidence in the Transport Minister and it was only right that he should resign. The First Minister should not have stretched the issue out over the last week and acted more decisively at an earlier stage. The weather has been better over the last couple of days but there is still much to be done to clear up the snow and ice from streets in Dundee and beyond. There are also reports, which I hope that the new minister has watched, that snow and ice may return towards the end of the week. The country must deal better with poor weather over the rest of the winter.